We hope you are, have been, or will be enjoying your spring break. UPCOMING EVENTS/ DEADLINES. . .
Special Guests : We are pleased to host the HOSA's National Executive Director, Deputy Executive Director, National Board Chair-Elect and others including Leading Doctors and Healthcare Professionals to our SLC. Let's put our Ohio hospitality and pride front and center! Workshops : New to this year's conference. We heard you and now have initiated leadership workshops for the first time. We ask for your help to encourage your students to attend the workshops. Check your convention program schedule and challenge your students to attend. Movie : During the Round 2 competitive events will be hosting three events in the Ballrooms for students who may not be competing in Round 2 and for those who finish their competitions. These events include a "How to get into college and financial aid panel"; the finals of the Anatomage competition, and presentation of a movie -- Contagion. The Union Station Ballrooms will provide a safe place for your students who are not competing or attending workshops. This will allow you to help conduct the competitive events without fear of your student's safety. Special Drawings: There will be a drawing for three students who has attended workshops and visited vendor table displays. Each of the students will receive a significant prize. The advisors who have the largest number of students and the advisor who has the greatest percentage of students will also be awarded a significant prize. Specifics will be announced in the next two weeks and at the opening session. Expanded Sales Booth : We will have for sale several items for your students. 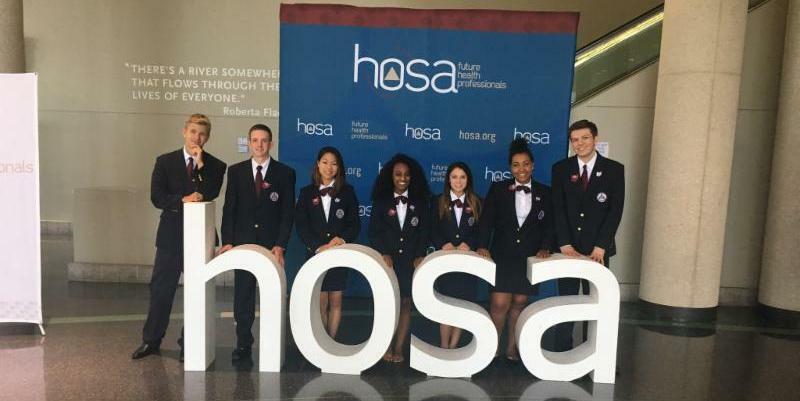 These include HOSA ties for males and females, HOSA portfolios, pencils, throwback tee shirts, and we are featuring a specially designed Ohio HOSA tee shirt for sale. Cost is $10. This new tee shirt is in addition to the already provided convention tee shirt given to each attendee. National Pediatric Cancer Foundation: We have secured a limited number of Cheryl's cookies that we will have available for your donation. 100% of the profits to the NPCF. Stop by the Sales Booth to support this worthy cause. Attendance : This year's SLC attendance will be a record-breaking attendance. We have over 1,700 pre-registered students, advisors, and chaperones. In that regard, we have theater style seating in the Ballroom. Delegates : In your registration box you will receive delegate badges for them to affix to their badge. We also have reserved seating - front and center of the stage of your delegates during the opening session. Medical Forms and Code of Conduct Form: If you submitted students and advisors forms at the FLC or Regional Competitive Event or the Cavs game you do not need to submit copies at the SLC. If you have a new attendee coming to SLC you will need to submit these forms at the registration desk. For safety purposes all attendees should have a copy of their medical form with them during the conference. Outstanding HOSA Chapter Books : Chapters must drop off their Outstanding HOSA Chapter Books at the registration no later than 10:30 AM on April 9th. GRR's : Remind students to read the General Rules and Regulations that are posted on the National HOSA website. Students must show a hard copy or a copy on their phone to the judges. Guidelines and Rubrics : Remind students to review the guidelines and rubrics for their competitive event. Competitor Items : Students must bring the items listed in the guidelines as stated for their competitive event in order to successfully compete. Photo ID: No photo id required to participate in SLC events. Recognition Award Hours and Donations : Chapters and members are reminded that they can continue to upload hours and donations to the website until March 31st for recognition at the State Leadership Conference. Guest Speaker : We have secured Dave Roever to speak at the Closing Session. Dave has spoken to high school-aged groups up 60,000. He will share his inspirational story and be available for one-on-one visits and autographs. Dave will also have several books for purchase. State Leadership Conference is scheduled for April 9-10, 2019 at the Columbus Convention Center. Details are posted to the Ohio HOSA Website. On March 9, 2019 fourteen members were interviewed by the nominating committee. Congratulations to all members who were interviewed. Your willingness to serve Ohio HOSA was evident and much appreciated. The following members, listed in alphabetical order, are slated for office and will be voted on by the delegates at the opening session. was asked to do it. I am sure you have read or hear of this poem by Eugene Harvey. It continues however the idea is clear. I want to begin by thanking all the advisors who have 'stepped up to the plate" thus far. I have had overwhelming response from many advisors and chaperones. We will need Everybody to help out in some fashion. The goal is to ask any advisor to volunteer for one activity. Later this week I will be sending areas of need for volunteers. Your Ohio HOSA, Inc. Board has approved presenting a special tee shirt to all advisors who volunteer. We need help with holding area leaders, test proctors, and supervision of the ballroom for the April 9th evening events. Your expertise and assistance along with that of industry representatives will allow us to provide those positive experiences. Send an email to Jim Scott to sign up another teacher or your administrators that may benefit from this weekly newsletter.